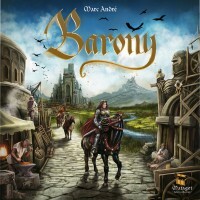 Designed by Marc André (Splendor), and illustrated by Ismaël Pommaz (Archipelago), Barony is a game in which players assume the role of one of four barons who, with their armies of knights, must colonize the most rich and fertile lands and defend them against the opposing barons. Each player strives to climb the stairs of power with the ultimate goal of becoming the new king. The game is played by first randomly creating the board for varied play each time. Each turn, players will only choose one action from six possible actions, allowing for fast game play. These six actions are Train, Move, Rally, Build Village, New City, and Gain Title. Players will train knights, capture territories, and build upon various types of terrain that affect the types of resources gained. As players trade off different resources, they will gain titles, and the first player to attain the title of Duke triggers the end of the game. The player with the most points at the end of the game become king and is crowned the winner. You start the game with the noble title of Baron and your goal is to become Duke. You do this by building villages and strongholds (collecting resources) or building cities (victory points). Expand your territory or destroy villages by moving your knights. The components are beautifully made: the pawns are great and the land tiles are thick and subtile illustrated. The rules are well explained and easy to learn. Only 6 possible actions, straightforward scoring. The game plays a bit like “Catan meets Chess”, there is no luck involved, 1 action per turn and no hidden information. But Barony is an elegant game, there are no more than 4 different pieces and only the knights can move. The random setup makes every game different, and the turns can be very quick. I don’t like Chess but I love Barony! Possible problems for the colour-blind (not for me)? Placing your 3 cities at the startup will be crucial for the rest of the game. It’s a tense game, but the end can be a bit of an anti-climax. Barony is a beautiful, strategic and elegant area-control game. Check ik out! Add a Review for "Barony"